This is a fun Classical-era piece that’ll challenge you with its fast scale and chord patterns – it’s great for building your technique. So let’s get started! A brief history of Clementi talks about the life and times of the guy who wrote this sonatina, which is always an interesting piece of the puzzle when we’re learning Classical music. We talked about sonata form and sonatinas on this channel as well. We’re going to briefly discuss some of the same concepts today, but it’s a good idea to familiarize yourself with those concepts first. Especially check out the video on sonatinas, since we use this exact Clementi sonatina as our example. I always like to talk a bit of backstory before getting into the nitty-gritty of a piece. This sonatina, op. 36 no. 1, is the first of a collection of six very famous sonatinas by Muzio Clementi. It’s also the easiest, hence why we’re starting with it. Since Clementi was at the front of the piano wave, he was one of the first composers to advocate and write for the piano. At the end of the 18th Century, harpsichords were being phased out, and pianos were growing in popularity. Clementi was a big fan of pianos (even being in the business of manufacturing them), and wrote lots of music for teaching and learning on the piano. Among those are his 6 sonatinas, arranged in the book by order of difficulty. 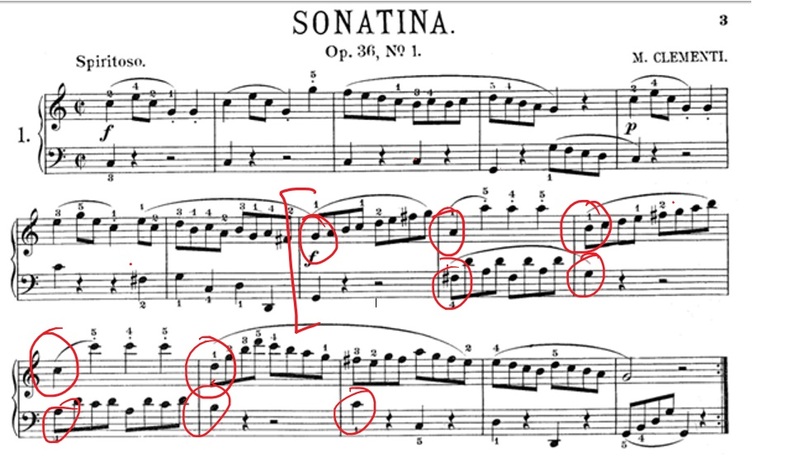 As previously mentioned, this first sonatina in particular is very famous, and it’s one of a handful of pieces that I tend to force on my students when they’re at this level, since it’s so rewarding to learn and play – and is a great gateway to more challenging sonatinas and sonatas. 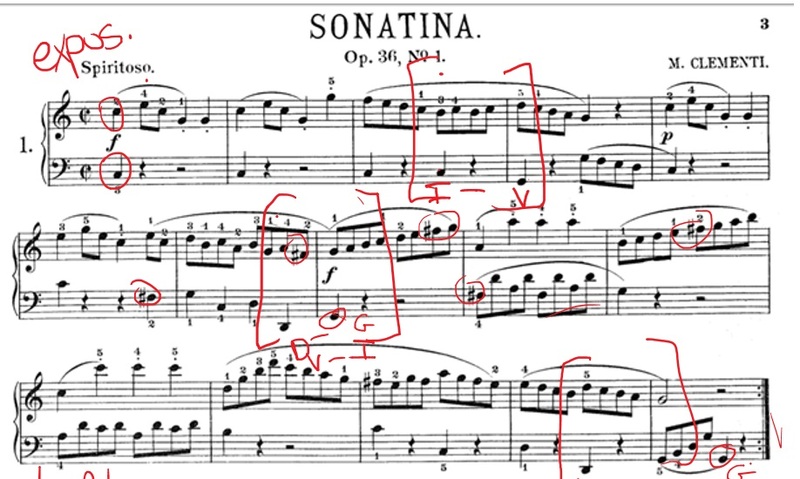 This is pretty typical for a sonatina. We have fast outer movements and a slower inner section. 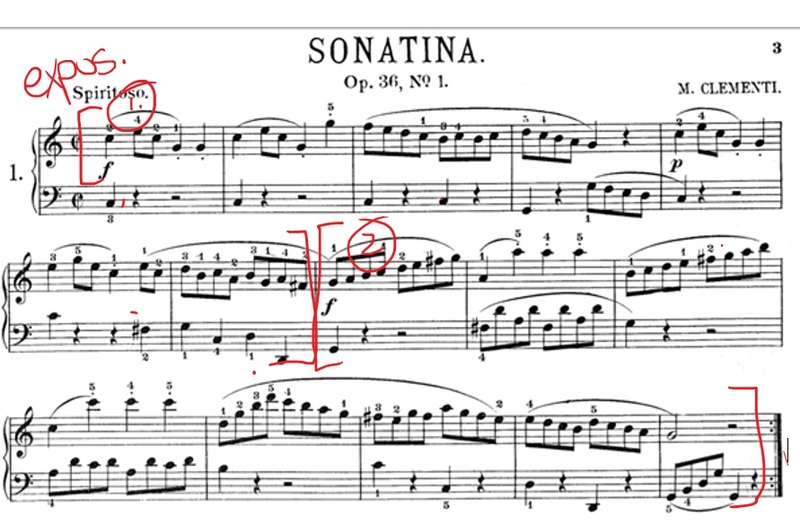 It’s also typical that the middle movement be in a different, but related key, than the actual title of the sonatina (Sonatina in C in this case). Let’s start by taking a look at the first movement. 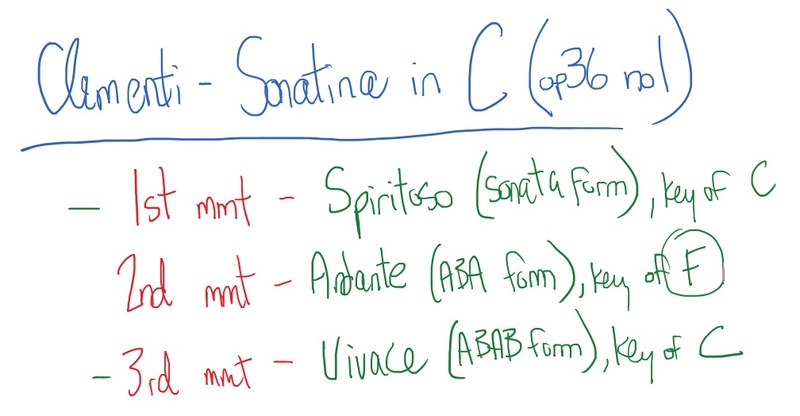 So since the first movement, Spiritoso, is in “sonata form”, let’s review what that actually means (and if you’re really confused, check out the sonata video). The exposition is the main tune of the piece, and usually has a couple different “themes”, or sub-parts. The development goes a little wild – it usually travels to a darker, more contrasted place – and then the recapitulation returns to the tune of the exposition. Another feature of sonata form is modulation. Modulation is where the key (the “tonal center” if you want to get fancy) shifts. 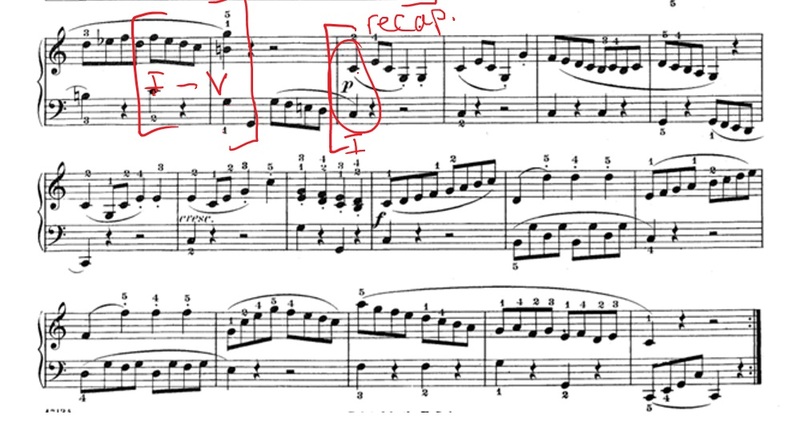 So in the exposition, you can see that we’re happily in C major, and then suddenly we’ve got all these F sharps. Somewhere along the way, the tune shifted to the key of G major, which is further evidenced by the last notes of the exposition (G). 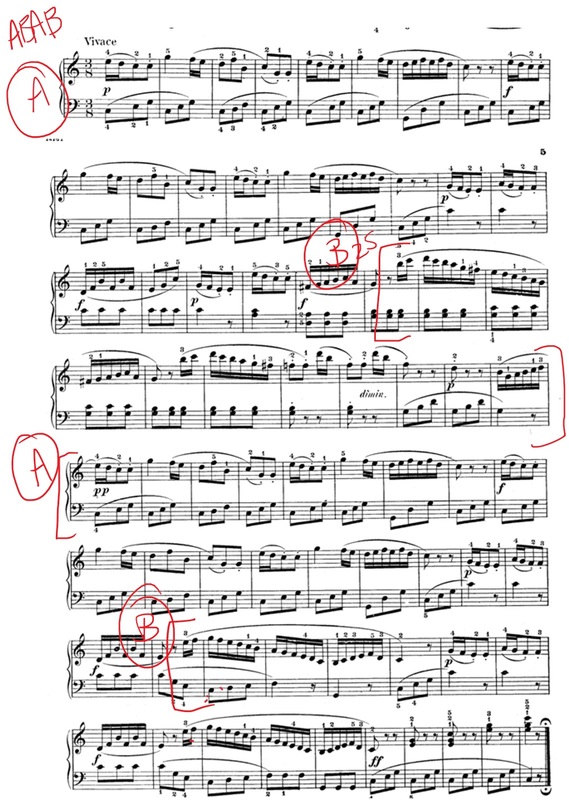 I don’t want to dwell on this too much, but if you check out the cadences in this piece, which are easy to find since they’re every four bars, they show us where we modulate to the key of G.
The first cadence is imperfect, going from tonic to dominant (and thus creating suspense). The second cadence is a perfect one – dominant to tonic – but in the key of G! When we play it through, you’ll notice that landing on this G, which just four bars earlier sounded tense, now sounds completely natural, like “home base”. That’s the beauty of clever modulation, switching keys without sounding obvious about it. (If you’re confused about all this cadence stuff, we did a video on them a while back. Think of them as the ends of musical sentences, like a period). So we start the development section with some darkness, in the key of G major. Our first cadence is plagal (IV-I), and then Clementi modulates us back to the key of C for the next cadence. We have a C-G, which is an imperfect (I-V) cadence, giving us that suspenseful sound – whereas in the previous bar the same notes sounded much more resolved. Cool, huh? Then we begin the recapitulation in the key of C, but down an octave and with some changes at the end. Before we hop to the keyboard, there’s one more thing I want to show you in the exposition. The exposition usually has more than one theme (or main tune), so let’s look at where those are. The first theme is obviously at the beginning, from mm. 1 to 7. After that, you’ll notice the notes go in a different direction – suddenly you have these scale patterns – so that’s our second theme, or second tune. The second theme is where the modulation magic happens, and it takes us right up to the development section. Patterns like these not only help your memory when you’re learning a piece, but they also end up sounding really pleasing to the ear, even if you have no idea why. Let’s look at the exposition section first. Our Italian marking at the beginning declares “Spiritoso”, or “spirited” – so nice and loud and bold. So first, did you notice the two different themes? We have theme one with this bold broken chord figure, and then theme 2, with our running scale patterns. It’s pieces like this that cause me to smugly say to my students, “that’s why I make you practice scales.” Scales aren’t just random exercises – they’re patterns you’ll see over and over again in music you learn (especially Classical music). We’ve got two G scales – the first one is an exact G scale (mm. 8), and the second one is a G scale that just starts on D instead (but still has the same finger pattern). When you practice your scales, you might be practicing them with a slight crescendo as you move up, and a slight diminuendo as you move down. This gives the scale a lifelike, breathing quality and makes it much less robotic-sounding to play. We want to apply the same concept to these upward scales – we want to get a little louder, which adds to the excitement. There’s a little bit of a brain teaser in bar 13 when your fingers have this zig-zag pattern. This is the part of the piece where students usually crash and burn when they’re first learning. The whole exposition goes well – until we hit the zig-zag. So I encourage you to turn this into a little finger drill, just to get the hang of the movement. Then we have the development section, which has a darker, more twisted sound. And then, the recapitulation – a return to the exposition, but lower and with a few changes at the end. Okay, let’s move on to the slower second movement. 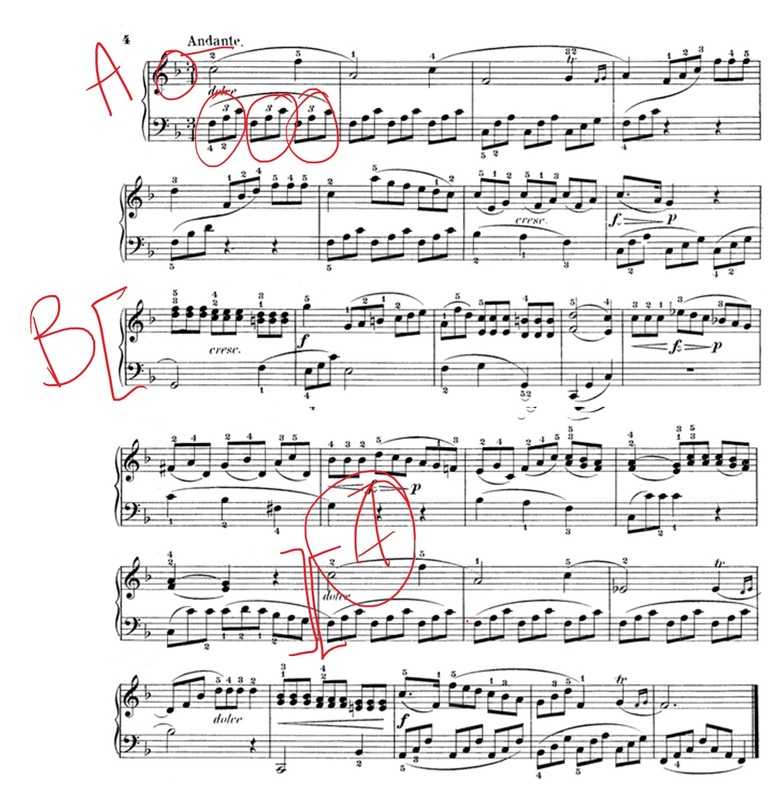 Looking through this andante (walking speed) section, you’ll see that it’s in the key of F (evidenced by the Bb in the key signature), and it’s full of broken chords. Broken chords are beautiful and elegant, and tough to play in a balanced way. We’ll talk more about that when we hop to the keyboard. This movement is in ABA form, so let’s take a look at the overall structure. Obviously the beginning of the piece is the start of the A section – where does it change? If you look between bar 9-17, you’ll notice that the patterns and chords change significantly, so this is our B section. Where does our A section return (with a couple changes)? Bar 18. The main problem with the broken left hand chord patterns are keeping it smooth and quiet. We want the left hand to be the backdrop, or the canvas. The right hand melody is the paint, and it should be bright and clear. Oftentimes when we play fast, there’s this tendency to tense up and play heavily, so we’re going to work on that. Keep the left hand subdued and relaxed so that the right hand notes can stand out clearly. Another way to capture the elegance of the left hand is to pay attention to how your wrist and arm are moving. Your wrist should sway a little as you play – not in a dramatic swinging way, but just a little rotate as you move your thumb to the keys. This creates a more natural effect than keeping your fingers straight the whole time. A-G-A-G, and then finish with the F-G that’s written in the score. I play all the trills in this movement the same way. Now let’s take a look at the B section. Pay attention to these harmonic thirds, that you keep that triplet feeling going. We do this by slightly accenting the first note in the group of three. You want it to sound a little like “down-up-up”, with more weight falling into the first of three notes, and then a lighter “up” motion for the 2nd and 3rd notes. Then we have our dolce, or sweet, return to the A section. The last four bars are the main challenge, so be sure to drill it on its own, while paying careful attention to the very useful finger markings. And now for the vivace third movement – fast and lively. Let’s start in the same way – by figuring out where the different sections are. Our A section is obviously going to start at the beginning. It changes very clearly at bar 25, where suddenly, through a clever modulation, we’re in the key of G. Then at measure 35 we’re back to the first theme, the A section. Then we’re back to the B section on measure 63. This is a good time to bring up the Q&A style of songwriting. Let’s take a look at the first four bars – we end on a G, which is our “tension” note. It doesn’t feel complete – it feels like a question. The next four bars are pretty similar to the first four, except this time we land on C – our home base, or answer. Q&A-style writing is incredibly common – just think about the famous Ode to Joy. It’s something you’ll notice in a lot of your music, and it’s good to know if you’re interested in songwriting. So in this movement, we’re going for the gusto. We’re going for excitement! There are a few ways this is achieved – there are lots of high notes, lots of fast notes and runs, and lots of dynamic contrasts. These are the elements that, when combined, create that lively vivace sound. Notice the big p-f dynamic contrasts. This section brings elements of the first and second movement together – we have broken chords like the second movement, and in the B section, long scale passages like the first movement. It’s a way to tie all the movements together. Now let’s look at the B section and take a look at those running scale passages. This part is a little tricky because the finger patterns in the right hand don’t perfectly mimic a G scale. The best way to start getting the hang of this part is to work on it hands separately. Then we have a little running passage, which takes us back to the A section, and the key of C, followed by another B section to close. The ending of the B section is the trickiest. We still have those long right hand scale passages, but down an octave – except this time, the left hand is doing a contrary motion movement instead of little chords. You’ll find that you’ll need to do some bar-by-bar work here to keep everything smooth, and avoid that thing where the whole piece sounds great, with a turbulent and stunted ending. I hope you enjoyed this fairly lengthy look at the Clementi Sonatina in C major – it really is one of those critical grade 3 pieces. It’s practically a rite of passage for the level, and opens the door to more difficult sonatinas and sonatas in the future.